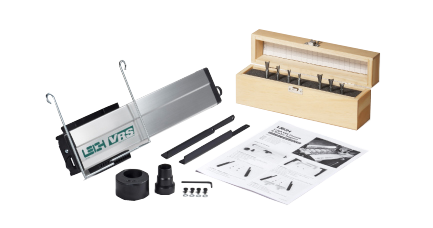 Combine the VRS with a Leigh brand bit set & save! 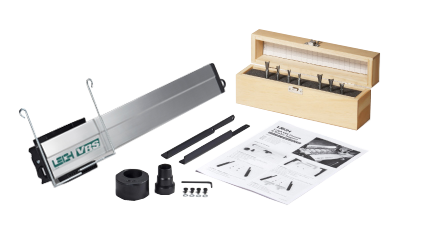 Kit includes one VRSD24 Vacuum & Router Support and one 13 Piece Router Bit set (2411-8). Bit set includes Through Dovetail bits 50-8(1/4”), 60-8(5/16”), 70-8(3/8”), 75-8(7/16”), 90(11/16”), 100(13/16”), 150(7/16”), 160(1/2”), Half-blind bits 101-8(10°), 112-8(12°), 128-8(18°), a 5/8” guide bushing for 1/2” shank bits (716C), a 172-8 1/2” to 8mm collet reducer, and FREE bit storage box. Kit includes one 12" VRS and one 1607-8 bit set. Bit set includes 8° Through Dovetail bits 50-8(1/4”), 60-8(5/16”), 70-8(3/8”), 75-8(7/16”), Half-blind bits 101-8(10°), 112-8(12°), 128-8(18°), and FREE bit storage box. Save when you buy two accessories! Kit includes one 18” VRS and one 1607-8 bit set. Bit set includes 8° Through Dovetail bits 50-8(1/4”), 60-8(5/16”), 70-8(3/8”), 75-8(7/16”), Half-blind bits 101-8(10°), 112-8(12°), 128-8(18°), and FREE bit storage box. Kit includes one 24” VRS and one 1607-8 bit set. Bit set includes 8° Through Dovetail bits 50-8(1/4”), 60-8(5/16”), 70-8(3/8”), 75-8(7/16”), Half-blind bits 101-8(10°), 112-8(12°), 128-8(18°), and FREE bit storage box. Kit includes one 16” VRS and one 1607-8 bit set. 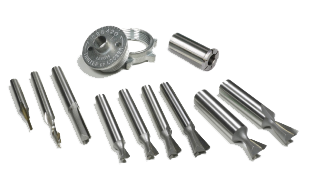 Bit set includes Through Dovetail bits (8°) 50-8(1/4”), 60-8(5/16”), 70-8(3/8”), 75-8(7/16”) and Half-blind bits 101-8(10°), 112-8(12°), 128-8(18°) PLUS a FREE bit storage box. Great savings when you buy the kit! 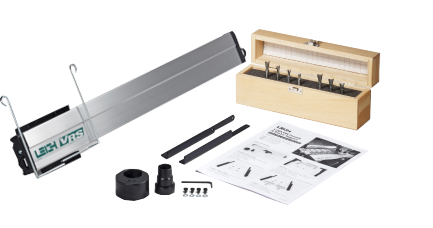 Includes 8° through dovetail bits 50-8(1/4”), 60-8(5/16”), 70-8(3/8”) and 75-8(7/16”), straight bit 140-8, half-blind bits 112-500(12º) and 128-500(18º), box joint bits 163(3/32”) and 166(3/16”), one e-Bush (e7) and one collet reducer 172-8 (1/2” to 8mm). Includes 3/16”(166) and 3/8”(173) HSS spiral upcut bits for box Joints, 3/8”(70-8), 7/16”(75-8) through dovetail bits, 5/16”(140-8) straight bit for half-pitch through dovetails, e-Bush (e7) for half-pitch through dovetails and one 1/2” to 3/8” collet reducer (172-375).